Despite the clear skies in the night, and the promise of better weather today, the cloud was back down again, and it was grey all around though, at least, it wasn't raining. Breakfast was, as usual, self-service for the most part, with Graham just serving the cooked food at 08.00. Before breakfast, whilst everyone was waiting for the two kettles to boil for tea and coffee, I found one of the younger ladies just about to tip out most of the contents of one of them that was nearly boiling, as she was desperate for a cup of tea and wanted it to boil faster. When I stopped her from doing so, she made some comment about how she really ought to think of the environment, though my main concern was the lack of consideration for everyone else. This was not quite the spirit that any of the older hostellers would have had, as they were all trying to think of others before themselves. The four chaps heading for Grasmere all got off fairly promptly after breakfast, as they intended to get a bus from Grasmere to Windermere, where they could catch a train back home to be in time for a concert in the evening. They all had young families, so were trying to squeeze in a Coast-to-Coast walk in between family commitments by doing sections of a few days at a time. Nobody else was in much of a rush to get off, with everyone sorting out various bits of clothing that had been drying all over the place. The pyjama lady was not joking and was outside ready to get going in her red and white striped pyjamas, which prompted me to comment that if they needed the mountain rescue helicopter, there wouldn't be any problems in spotting her. The two Lancastrians were still undecided about whether to do the Mosedale Horseshoe, and decided to play it by ear, setting off up the Black Sail Pass, keeping an eye on the cloud level and the general weather situation. They, the four ladies, and the two younger ones all set off together for the Black Sail Pass, whilst I was the last away at 09.40, heading for Honister, following the Coast-to-Coast route. 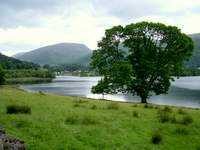 I learned from Graham, that Ennerdale is gradually being deforested, as part of a program to return it to its natural state. The conifers will be replaced by some broad leafed trees, but much of the valley will be left to nature to determine which way it goes. 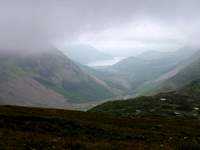 Ennerdale was chosen because it is one of the most remote valleys, with no public road access for much of its length, so is an ideal place for this experiment. I note, also, that in quite a few other places, forestry plantations are being felled and, either not being replanted, or replanted with native broad leaved trees in a more informal layout. This can only be a good thing and could help to reverse some of the damage done to the beauty of the countryside by all the densely packed trees in regimented rows. 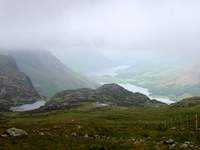 After two easy, though wet, days, I was feeling rejuvenated; my feet were comfortably free of aches and pains, and I had renewed energy in my legs, so I found it a fairly easy climb up the steep path out of Ennerdale, even with the full weight of my pack. The ground was still quite waterlogged in places, but not enough to cause any problems. As I climbed up, I could see the tiny figures making their way up Black Sail Pass, just as I had watched people yesterday the other way around. The Lancastrians had split away from the others, and were nearly at the top of the pass, but I couldn't quite see which way they headed from there, though with the cloud still low, I suspect that they just went down the other side and on to Wasdale. The others were some way behind, and as I reached the top of my climb and made my way over easier ground, they were too far away to see any more. There were quite a few people out walking, though that was only to be expected at a weekend. I wasn't sure whether to go back up over Brandreth and to follow the ridge along over Grey Knotts, but the sight of low cloud lurking over the tops soon decided me to take the lower route of the Coast-to-Coast. From there, just below the cloud level, there were some good views over to Buttermere and down Ennerdale, despite the murky weather. When I embarked on this walk, I had expectations of wonderful mountaintop views over brightly lit lakes, valleys and fells, but, by now, I was resigned to the fact that this was going to be a very rare occurrence on this holiday, so any walking that didn't involve driving rain and mist was a bonus. This morning, the rain was just managing to hold off, with only a few spots every now and again. The wind was also fairly gentle, so I considered myself fortunate, settling for scenery of cloud-covered mountains and grey valleys as being far better than views of less than 50 yards in any direction in the mist. After two hours of easy walking, I stopped for a rest and a bite to eat just above Seatoller, having passed all the visitors to the Slate Mines over Honister, and all the cars making their way up the pass, which ran parallel to my path. I spent some time writing up my diary and, before I realised it, I had been there for the best part of an hour. I wasn't too worried about this, as I knew that, although it is given as being 15 miles in Wainwright's guidebook, by taking a shortcut through Stonethwaite, taking the direct route down to Grasmere instead of going over the crags, and going to Thorny How Youth Hostel, which is some way before Grasmere itself, it was not much more than 12 miles. Rather than just joining the road into Seatoller, I decided to take the path up the hillside leading into the woods above the village, but went too far up and had to double back, following the boundary wall of the woods down to the path I should have taken. This turned out not to be a good idea, as I started to enter a dense growth of bracken, which was up to shoulder height in places and even more difficult to get through where it had been partially flattened and was all tangled together. 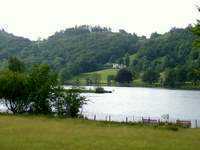 After a struggle, I eventually reached the entrance to the wood and followed the path, emerging at Longthwaite Youth Hostel. It was then just a short walk along the road to Stonethwaite, where I walked down through the village to take a look around, before returning to the bridge over Stonethwaite Beck. When I passed the pub, I saw a dedication above one of the benches outside saying 'In memory of a sunny day in Borrowdale'. I was not sure whether it was intended in a humorous way, but it sounded like there hadn't been a sunny day for a long time, which just about summed up my feelings at the moment. The weather was just about holding up, but there were spots of rain from time to time, just to remind me not to get complacent. I stopped for the rest of my lunch just before Eagle Crag, and eyed it up to see if there were any paths leading to the top, as I had half a mind to climb it. All I could see was a lot of bracken with no sign of a path, so, having had enough of bracken for one day, I decided to give it a miss and continued up the normal route alongside Stonethwaite Beck towards Greenup Edge. 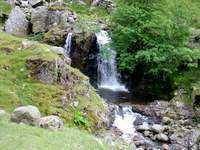 The ascent is quite steady at first, with several small waterfalls to be seen as the beck tumbles its way down the valley. Further up, the path gets much steeper as it climbs the face of Lining Crag. I was still feeling reasonably fit, so the steep sections were not too much of a struggle, and there was the added advantage that each time I stopped for a brief rest, I could turn around and look at the view, instead of a getting face full of rain and a view of mist. The view was dark and gloomy, but, at least, it was a view. 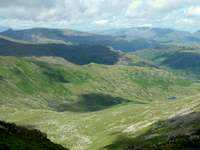 Near the top, I met a chap who was coming down, having climbed Eagle Crag and Sergeant's Crag. He said that it wasn't difficult and that there was a bit of a path up, whereas all I could see from a distance was bracken. This would have made an interesting little diversion from the Coast-to-Coast route without adding much more either in ascent or distance. As the ground levelled off, there was a lot more surface water about, which meant picking my way around boggy bits as best I could, whilst trying not to get my feet too wet. On Greenup Edge, I now crossed the path I had taken from Ulscarf to High Raise four days ago, having gone round in a large loop. 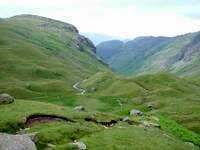 Although I had taken my time getting this far, I decided that I still had enough time to take the route over Gibson Knott and Helm Crag, which is more interesting than the direct route, even if it takes considerably more time and effort. It doesn't appear to be much further on the map, but the path winds in and out and up and down around the crags, so it actually involves more distance on the ground, as well as being slower because of all the scrambling about over stony, uneven surfaces. It was looking very dark over towards Grasmere, although there was a solitary shaft of sunlight on the side of Helvellyn, and I could see all the weekend traffic speeding over Dunmail Raise. 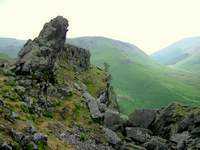 I kept feeling a few spots of rain, but never very much, until I got past Helm Crag, with its distinctive rocky summit sometimes called the howitzer because of its shape. A strong, cold wind sprang up along with a more significant amount of rainfall, but I hoped I might be able to avoid putting on waterproofs for the short walk to the youth hostel. After a short shower, the rain died away, as I made my way down the steep path from the summit. When the path reached the bottom, I thought I would just follow my GPS, having entered the coordinates of the youth hostel, as there were a few footpaths around that were not marked on the map. I got to a point where my destination was only 70 metres away, give or take some for the approximation of the grid reference, which can be 50 metres or so out in any direction. I then came to what looked like the private grounds of a large country house and I couldn't make out where the footpath was meant to go. I went straight on and found that it was actually a hotel with a very long drive down to the road, by which time I had gone a few hundred metres further from my destination. The road then looped round three sides of a rectangle to get to the hostel, so I had walked about half a mile round to get there when it must have been just over the wall at one point. The last stretch of walking over the crags had tired me out, especially as I was trying to walk quickly so as to finish in reasonable time, so I was quite glad when I reached the hostel at 18.10. I ordered my evening meal of potato soup and pasta carbonara, before going off to my dormitory, sorting out the bedding for my bunk, and having a shower. I last stayed here in 1992, when it was quite a small hostel, all in one building, from what I can remember. Since then, an annexe had been added with four dormitories, and a large part of the main building had been used to extend the reception and dining areas. The whole thing had been planned quite badly, as the toilets and showers were in the main building and most of the dormitories in the annexe. I had taken my boots off before entering the hostel, but then had to go outside to the annexe. Similarly, I had to go outside to get to the shower and back. When I went to the shower block, I found there were four toilets, six partitioned washbasins, but only one shower. From what I heard, the female facilities were much the same. Fortunately the hostel was not very busy at the time I arrived, with only one person having a shower before me, but when a lot of people arrive together, I could envisage some very long queues. One good thing was that the drying room was very warm, so I washed out a few things and put them in there along with my boots to dry. For the first time in the Lake District, apart from at the top of Great Gable, I actually had a good signal on my mobile for my call home, saving me from having to feed money into the youth hostel pay phone, though, in fairness, that probably didn't cost any more than it did on my mobile on a pay as you go tariff, it was just that the mobile was more convenient. Dinner was any time between 18.30 and 19.30, so I went along a little after 19.00. There was a group of four people in there, one chap from my dormitory who was from Sheffield with three of his nieces from America, who wanted to see the Lake District. There were also a couple of teenage girls, just finishing off their meal, and a mother and daughter still eating midst huge sprawl of newspapers and magazines. I was the only other who was going to eat, and my meal was already there being kept warm, awaiting my arrival. The potato soup was very good, and the carbonara very large and filling, which, considering it was one of the cheapest things on the menu at £5.75, was very good value. The prices here were quite a bit less than at most hostels, where it is often difficult to find a main course for under about £7.50. The atmosphere, however, was such a contrast from that of Black Sail Hut, but was typical of the way most hostels are going these days, with groups of people all eating at different times and sitting in their own little groups. There were quite a lot more people staying at the hostel, but they were either self-catering, eating elsewhere or too late for the hostel meal. After dinner I went into the lounge, which was nicely carpeted, had quite new furniture and fine photographs of Lakeland scenes displayed on the wall, but with the chairs arranged all around the walls, it was more like sitting in a doctor's waiting room than a hostel lounge. 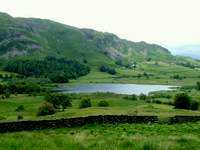 I decided to go for a lie down on my bunk, as I was feeling a bit weary, thinking that I might walk into Grasmere village later for a drink. However, I did my usual trick of dozing off, only to wake up when it was getting too late to go out, so just went to bed. I awoke at 07.30 and peeked out of the window to see glorious sunshine, which gave me inspiration to get myself up and get going. Breakfast was from 08.00, and there were already quite a lot of people in there when I arrived. There was a large group of cyclists plus the people I had seen last night. The tables were all crammed together, so it was quite difficult to squeeze in and out to get things from the buffet, and to take thing to the washing up area. The buffet was the best one I had encountered on this walk, with a number of things that are not normally on offer, including grapefruit juice and grapefruit segments. The things I had put in the drying room, including my boots, were bone dry, as I thought they might be. 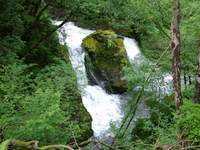 The only problem was that my walking socks, in particular, were as hard as if they had been starched, so were not so comfortable to put on. The chap from Sheffield was wondering where to take his nieces for a walk, as they didn't have suitable footwear for anywhere that might be wet or muddy, so it would just have to be a token gesture going along well-made footpaths. I managed to get everything ready, and was off at 09.05. The weather by this time was not quite as bright, but the forecast gave 50% chance of cloud-free summits, which was better odds than I had had for quite a while, and well worth chancing the high level route over Coniston Old Man that I had planned, though there were also strong winds and showers predicted as well. The walk into Grasmere used to be along the road, but now there is a permissive path through National Trust land for a reasonable part of the way. I called in the village for a sandwich, as I still had a few things left over for the rest of my packed lunch, and I took the opportunity to post off another two maps that were no longer required. 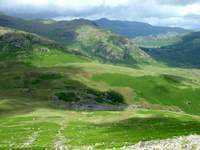 My route needed to take me over to Skelwith Bridge and from there to Little Langdale, where I could pick up the path to Wetherlam, then onto Swirl How and along the ridge to Coniston Old Man. There are a few routes from Grasmere to Skelwith Bridge, but I didn't want to do much climbing at this stage, as there would be enough of that later on, so I settled for taking the road to the west of the lake, then a track up through the woods to Loughrigg Terrace, bringing me back onto the road again near its highest point by High Close. 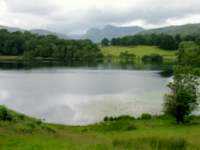 Lower down, there are some good views across Grasmere Lake, but these get lost further up because trees get in the way. On the way down the road, one of my feet started to hurt across the top of the toes, so I had a stop to sort out the problem. Because my boots and socks were so dry, thanks to the super efficient hostel drying room, the socks felt as if they had been starched and the rib where my inner sock was joined just above my toes was rubbing badly. It would have soon caused blisters if not corrected, so I tried to soften up the sock by rubbing it about and also positioned it so that the rib was out of harms way, which then cured the problem. Had everything not been quite so dry, things would have softened up a bit on their own, and I wouldn't have had the problem. 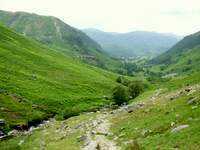 Part way down the hill, I took a path leading beneath Loughrigg Fell to Loughrigg Tarn. The top of the fell provides some fine views, but I didn't want to do any extra climbing, so contented myself with the low level route by the tarn, providing me with the classic view of the tarn, with the Langdale Pikes, which were just about clear of cloud, in the background. I joined the road to Skelwith Bridge, and was quite glad that there was a footpath running parallel for most of the way, as there was quite a lot of traffic and little space for walkers. From Skelwith Bridge, I was able to follow the Cumbria Way to Colwith Bridge, passing Colwith Force waterfalls, just off the route, on the way. The falls were quite impressive with different viewing places, first from the front, where the upper falls and the twin lower falls could be seen, then from the side, giving a closer view of the lower falls, and finally, one right up beside the falls with a view of the waters dashing down below. 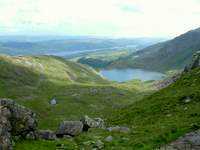 There is a lot of very good walking country around here, particularly for those who don't wish to climb high mountains, but still want to get good views of the hills, mountains and tarns round about. A little further along, I came to a stile with a group of about twenty walkers coming the other way. They were climbing over the stile and then, instead of standing to one side, were all congregating on the footpath right next to the stile itself. Not only were they oblivious to anyone else trying to use the footpath, they were even obstructing some of their own party as they tried to get over the stile. Eventually, when the last members crossed over, I was able to push my way through and get on my way, but this sort of behaviour is all too common with large walking groups. I then parted company with the Cumbria Way, which takes a low level route to Coniston, and was my bad weather alternative route. Instead, I continued on towards Stang End, where it started to rain. Rather than putting on my waterproofs right away, I pressed on to the nearby woods, where I could get some shelter from, what I hoped was just, a passing shower. The rain eased off, and I passed by Low Hall Garth, stopping a little further on for some lunch, overlooking Little Langdale Tarn. The chicken tikka roll, which I had bought from a small shop in Grasmere, was so full of chicken tikka that it was difficult to eat without bits dropping out on the ground, generally making a mess on me before they got there. It was quite expensive, costing £3.25, but for the amount of filling in there and the taste, it was not bad value. A walker sat on a bench nearby reading his Sunday paper, but a sudden shower of rain made this not very practical, and drove him away. Setting off again, I ignored the right of way shown on my Ordnance Survey map, as there was no actual footpath there, but continued onward to the old mine workings, where there is a footpath. This is just another case where the right of way is a rather meaningless line on the map, just causing confusion to walkers. It would be far better to show the real footpaths with more prominence. The trouble is that a right of way is a legally defined entity, and requires legal procedures to change its course. Where one has been defined in a rather haphazard fashion, the tendency is to leave it as it is to avoid the effort and cost involved in changing it. After the steady ascent to the mines along the valley, the footpath up to Wetherlam climbs steeply up the hillside towards various bits of mine workings higher up. I kept setting myself little targets of how far I should climb before my next little rest, each time looking back down to the mine buildings and watching them get smaller and smaller. By now, there were quite large areas bathed in sunshine, but also other areas in very dark cloud. Unfortunately, the way I was heading was into the cloud. Above the mine workings, the path went off at an angle to meet the main path along Wetherlam Edge, and the going got a little easier. By the time I reached the summit, the cloud had just lifted, though it was still covering the rest of my route over Swirl How to Coniston Old Man. However, the views over to the north were very good, with most of the major fells: Skiddaw, Blencathra, Helvellyn etc. free of cloud, with many in bright sunshine. A strong, cool wind, some mist and some rain, made me put on my waterproofs, as I made my way along the ridge to Swirl Hawse, the dip before the ascent up Prison Band to Swirl How. As I reached there, the cloud suddenly cleared from all around and I could now see both Swirl How and Coniston Old Man, with lots of sunshine around. I stopped for another bite to eat, and to take off my over-trousers, but left on my jacket to keep out the cold wind. I met some chaps who were coming down towards me. They had come all the way over from Coniston Old Man in the mist, only to find it clearing as they were on the way down. 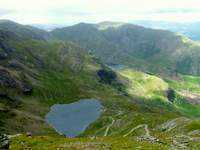 I continued on up the steep ascent of Swirl How, but it didn't last long, and I was then soon walking southwards along the ridge towards Coniston Old Man. The cloud had not cleared completely, but was forming continually as it came over from the west and dispersing again over to the east, being blown quite rapidly in the strong wind, but there was a lovely view over Coniston Water, which was a vivid blue, with the land all around a verdant green. I had grown so accustomed to seeing everything in thick, cloudy conditions, that the vivid colours, brought out by the bright sunshine, provided such a welcome contrast. Along the ridge, I had to do battle with the powerful side wind, and the summit ahead kept going in and out of the cloud, but the walk, though quite a long way, was fairly easy up the broad ridge. At the summit of Coniston Old Man, I took shelter by the large base of the cairn, along with several others. The cloud was only just clear of the summit, and the fell-sides nearby were in its shadow even though more distant things were in sunshine. 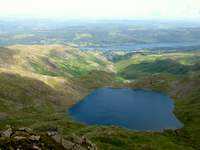 After a while at the summit, deciding that it was not likely to brighten up any more, I set off on my way down to Coniston. 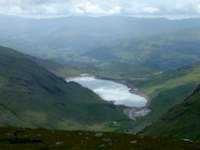 One of my options was to go down via the horseshoe round Goat's Water, over Dow Crag, which is a fine walk for the scenery in good weather, but, at the moment, was suffering from the same cloud conditions as Coniston Old Man, and very overcast. Time was also a problem, and this longer route also involved another several hundred feet of ascent, so I took the direct route instead. As I dropped down the steep path towards Low Water, there was, at least, some shelter from the strong wind. At a fork in the path, I found a triangular patch of foxgloves, tightly packed together and very colourful, as if they had been cultivated, and I was surprised that they could flourish so well at this altitude. Past Low Water were some old quarry workings with various pieces of rusting machinery, as well as some very thick wire rope lying along the track for a way, presumably having been used for hauling things up and down the steep slope. The path eventually joined the track coming down from Coniston Copper Mines, and brought me out just above Holly How Youth Hostel. Near the bottom of the track was a cattle grid and, just in front of me was a sheep, which, without any hesitation, walked deftly across the grid, obviously having done so many times before. In many ways it is hardly surprising that an animal that spends half of its life clambering over steep crags should be able to negotiate a cattle grid. I have heard of a number of stories about sheep getting over cattle grids, in one case by rolling over, in another by using another sheep like a stepping stone for others to get across, but this one just took the simple, nimble footed approach. It is no wonder that sheep are found in all sorts of places where they shouldn't be. I checked into the youth hostel at 18.05, so it was just as well that I hadn't taken the longer route, or I would have been quite a bit later. 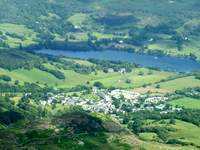 When I came to order my evening meal, I was quite surprised how expensive things were compared to most other hostels, but then I would probably have had to pay even more in Coniston itself, which is a very popular tourist spot. I had a nice refreshing shower, only to find that I had forgotten to take my towel, so I had to shake and brush off as much water as I could before putting on my clothes - it was either that or streaking along the corridor to get my towel. After all the soakings I had suffered on this walk, a little bit of wet like this was nothing to worry about, and would soon dry off. I was quite pleased to find, though, that I had a good signal on my mobile to call home. This was the first hostel I had come across that served real ale on draught, so I had a pint of the Jennings Golden Best before dinner for £2.95, which is the highest price I think I have ever paid for a pint of bitter. I was joined for dinner by a chap who had just completed his first day of the Cumbria Way, and we both agreed that the food quality and presentation were excellent and wouldn't go amiss in a high quality restaurant, so, from that point of view, the pricing was not unreasonable. The only thing is, though, that youth hostels are generally used by people on a limited budget, who are more concerned about stoking up with calories than having a gastronomic experience. The cost of accommodation and food is quite considerable, so it would be better for hostels to offer basic food at basic prices, as they used to do when I first started using them in the 1990s. It wouldn't do any harm to offer a few more costly alternatives for people who don't mind paying the price, so long as there were cheaper options available as well. The chap who was doing the Cumbria Way had found his first day, the one I would be doing in reverse tomorrow, quite difficult, as he was not used to carrying a heavy pack, or walking 15 miles in a day. 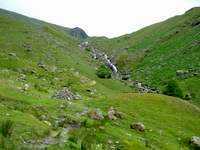 The walk doesn't go over any particularly high ground, but there are several lesser ascents over undulating country that add up to the same as that of climbing a small mountain. He was a similar age to me, but obviously didn't do the same amount of walking to keep himself fit. I spent some time writing up my notes in the lounge, with a fine view of the magnificent monkey puzzle tree in front of the hostel, with its branches draping like a huge candelabra and large balls the size of grapefruits on some of the higher ones. I didn't bother going into Coniston for a pint, as I had already had two in the hostel, so I went off for a fairly early night. I slept quite fitfully after the rather strenuous, but very enjoyable day - I find that the body tends to go into overdrive after a lot of exertion, trying to recover itself from the toils of the day, and not being conducive to a restful night's sleep.